X-Wave MP3 Cutter Joiner lets you edit MP3 files with no adverse impact to quality! With X-Wave MP3 Cutter Joiner, you'll be able to edit MP3 files as easily as you would a text file, with the familiar copy, paste, crop, and delete functionality giving you new freedom to work with audio! Make a mistake? There's an Undo function. Mistaken about your mistake? There's a Redo function, too! Even with these astounding abilities, you may not even need to perform any manual edits to achieve fantastic results with X-Wave MP3 Cutter Joiner! 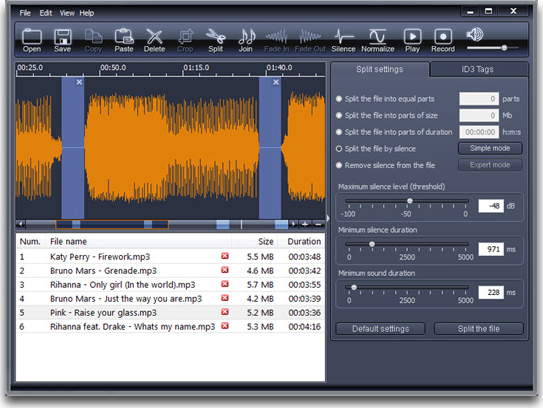 The silence detector, for example, can automatically split an audiobook MP3 into separate chapters, and the CUE splitter can split a DJ set into tracks. X-Wave MP3 Cutter Joiner can even go the OTHER way, giving you the power to take separate MP3 files and combine them into a single file just by dragging and dropping! Additional handy features abound with X-Wave MP3 Cutter Joiner! Ever have your ears blown out by an MP3 file that's SO MUCH LOUDER than the one before it? With X-Wave MP3 Cutter Joiner, you can now normalize the volume level of all of your MP3s! Listening to something on your PC that you'd love to capture for later? Yep, X-Wave MP3 Cutter Joiner can do that, too! 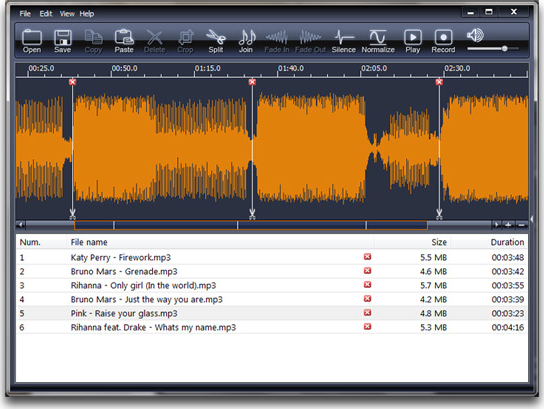 Edit MP3 files with no adverse impact on quality. Use familiar functions like copy, paste, crop, and delete. Automatically split MP3s based on automatic silence detection. Join separate MP3s into a single file by dragging and dropping. Normalize the volume of multiple MP3 files. Record anything that you can hear on your PC. After you purchase X-Wave MP3 Cutter Joiner 3.0 it may be used indefinitely. X-Wave MP3 Cutter Joiner 3.0 is licensed per computer, and not per user. Joe McCormick I just bought this program after trying the trial version. 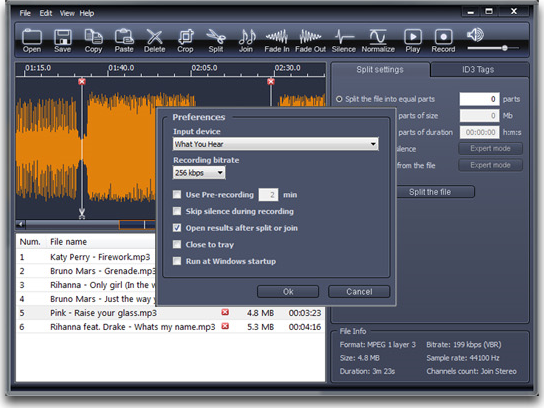 I have tried other programs like this for splitting some old records that I recorded a few years ago in to separate MP3 files and this program was easy and accurate to use doing manual splitting. I was not as successful with the auto split feature, but now that I have purchased it I will have time to play with it. For under $10.00 I thought it was a good buy.